The Pirate Bay – Away From Keyboard, a close encounter with the three founders of the world’s largest peer-to-peer file-sharing site, premiered at the Berlin Film Festival and synchronuously on the Net on 8 February. Now, the film can be watched and bought at its official site and torrented at — where else — The Pirate Bay. Since 2008, Simon Klose had followed TPB founders Gottfrid Svartholm aka Anakata, Fredrik Neij aka Tiamo and former spokesperson Peter Sunde aka Brokep with his camera. The film is built around the court trial, from its beginning in 2009 through the appeal in 2010 and the Supreme Court rejection of further appeal in February 2012. What unfolds is a clash of cultures, between hackers and industry, between a technological intelligence that only needs an IRC channel as an office and explores unlimited opportunities and a business mind that looks for anything that increases — or threatens chances for profits. For the latter, TPB serves as the copyright industry’s ideal culprit. We re-encounter the long arm of Hollywood through the US State Department putting pressure on the Swedish government. And we live through the final verdict again, finding all three guilty of „assisting in making copyright content available“, sentencing them to one year in prison which was reduced in the appeal, and to US$ 4.5 million in damages which was raised to US$ 6.6 million. Through Simon’s impressive images, we also get a glimpse of Gottfrid, Fredrik and Peter, of their personalities, what drives them, how they interact. While the camera is often very close to the protagonists, the director keeps his distance at first, showing mostly public images from press conferences, demonstrations, from the actual court hearings, from TV. In the last third of the film, Simon gets more personal, e.g. at the wedding of Fredrik and Lee in Vientiane. 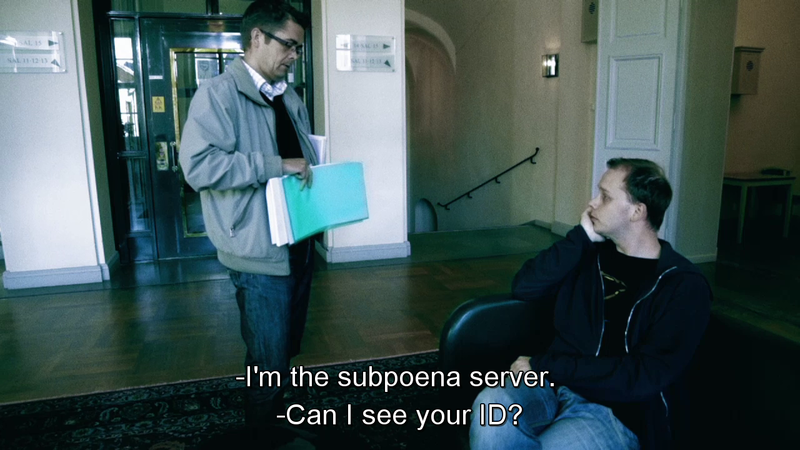 Some scenes have a real-life slappstick quality, like when the subpoena server uses Peter’s presence at the appeals court sessions to serve him yet another pile of legal claims from the Netherlands or from YouTube that Peter dumps in the next bin or refuses to touch. Peter himself praised Simon’s film but is also rather critical. Too much focus on the trial, too little on the fun of it all, and on the real people. But then the protagonist of a film is not necessarily its best critic. All three have long since moved away from TPB. Fredrik and Peter started the copyright compliant file-hosting service BayFiles. Peter co-founded the micropayment donation service Flattr. Yet, they have to pay a high price for their service to the global P2P movement. 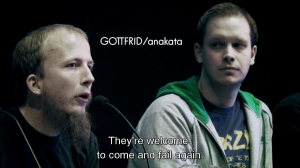 In December, Gottfrid was arrested in his home in Cambodia, extradited to Sweden and started to serve his prison sentence right before TPB AFK was released, as TorrentFreak reported. Peter’s Plea (an essential companion-read to the film, translated by Rick Falkvinge) for pardon „for a judicial system that has been steamrolled over by lobbyism and ignorance. But ultimately, I ask pardon for our future culture and communications.“ — was unanswered. Peter and Fredrik are wanted. Simon Klose’s documentary was funded by public institutions, peer-funding and public service broadcasters including the BBC and ARTE/ZDF. A version (4 minutes shorter than the original) is released under CC BY-NC-SA, encouraging remixing. And by means of free-licensing it is quite a success, certainly in terms of attention but I would assume in monetary terms as well. On 10 February, Simon blogged: „A day after the release the film has 408,360 views on Youtube, 27 000 seeders on TPB… Also the community created Dutch, French, Russian and Portugese subtitled versions.“ Currently it’s up to 1.4 million YT views. Theater and TV sreenings are starting now. And the best news is, a follow-up seems to be in the making, as Peter remarked: „I know that Simon has huuuuuge amounts of film that I’d prefer to have in the movie instead – more focused on happy people, lots of support from people all over the world.“ TPB AFK itself will already contribute to raising global support for Internet freedom. They can put revolutionaries into jail but they can’t stop the revolution. Meanwhile, The Pirate Bay goes on as ever, since October of last year safely in the cloud. It’s latest move is to sue the Copyright Information and Anti-Piracy Centre (CIAPC) in Helsinki — for copyright infringement! The anti-piracy outfit allegedly copied TPB’s homepage and the CSS file to set up what it claims is a parody of the Pirate Bay, where each search leads to a message informing about legal source of movies and music.